Crowe, a rock band from Burlington, Canada has released their self-titled independent debut, produced by the band. The invigorating thing about Crowe’s first album is how raw it sounds. Refraining from studio staples such as auto tune, pro tools and other studio magic, what the listener gets is four guys in a studio playing music because they enjoy it, not because they are trying to make a quick buck. The first song, "Satellite," sounds similar to Dinosaur Jr’s record Beyond, with wailing guitars and pounding drums that have no frills attached. The vocals in "Satellite" are strong, though without much range, but serve the purpose in a hard-hitting rock song. Songs like "Charms" begin with a punch-in-the-face guitar riff that causes people to take notice of what Crowe has to offer musically—a feel good rock record ideally suited for a lazy afternoon with a beer in hand. Songs like "Troubadour" have more of a garage band sound, with its fuzzy guitars and rougher vocals. "Troubadour" gets a bit lazy once the chorus hits, as if the band could use an energy drink, but still shows off the rock and roll riffs that drive the album as a whole. Despite the weaker track, Crowe is slowing climbing the ladder when it comes to success—they have been included on playlists for local radio stations in their native Canada. Hopefully with continued airplay, Crowe will see success in the United States and beyond. 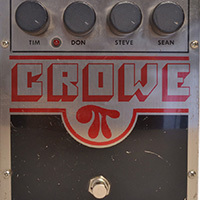 You can download Crowe for free via crowetunes.bandcamp.com.